In an interview with Erik Adams, Scott Aukerman talks about how they arrived at this ending. 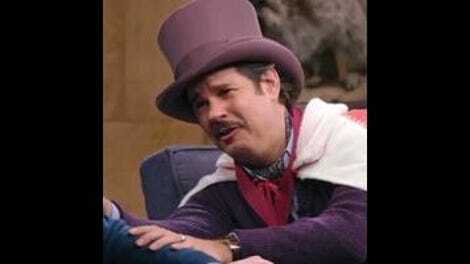 Instead of parodying famous finales or landing “a really big star,” he realized, “I really just want to be surrounded by friends and the people that made the show so successful.” In the same interview, Aukerman describes the entire series as “a love letter to the fans.” “Lord Andrew Lloyd Webber Wears A Purple Top Hat & Fabrice Fabrice Wears One Pink Fur Leg Warmer” reflects that affection, as well as an appreciation of the cast, the crew, and the show’s history by hewing to the reliable formula that makes the series the distinctive, sweet, silly success it is. When “Lord Andrew Lloyd Webber Wears A Purple Top Hat & Fabrice Fabrice Wears One Pink Fur Leg Warmer” begins with a rehashing of recent plots, it seems to promise a spectacular follow-up to the adventures of “Reggie Watts Wears A Purple And Yellow Quilted Sweatshirt.” But no. Despite the “previously on” opening (and the previous episode’s stinger that hints at a two-part episode), the last installment of Comedy Bang! Bang! isn’t another chase through time. In the world of Comedy Bang! Bang!, it isn’t even the last episode. Comedy Bang! Bang! does a great job with sweeping conceptual narratives, but there’s both comfort and dignity in retreating from the thrills of “Reggie Watts Wears A Purple And Yellow Quilted Sweatshirt” to the same format that built the show’s reputation. It leaves room for one last scolding from L. Jefe Manincharge (Matt Walsh), a final visit from Scott’s mother, an appearance by the widow Kulap, one last cranky character from Neil Campbell’s repertoire, a shout-out to regular directors Benjamin Berman, Stoney Sharp, and Danny Jelinek, and one last hurrah from the crew. But this 110th episode isn’t a pageant of farewells or an ambitious set piece. It’s the show fans know and love in its basic form. The only major diversion from formula is both smart and sentimental. Rather than the usual celebrity guest appearing under a real name followed by a wacky guest performance, both of tonight’s guests are recurring characters, and both are fan favorites. Tompkins always brings freshness to the consistent characteristics of Lord Andrew Lloyd Webber, like the cape-clasping prance as he takes the stage or his banter with Scott about American English’s abuse of the mother tongue. The rambling, understated comedy of their one-on-one segment harkens back to the podcast’s improvs, and to the earliest days of the television series. The episode title describes always outré returning guest/craft services coordinator Fabrice Fabrice (Nick Kroll) as wearing one pink fur leg warmer, but it could just as easily read “Fabrice Fabrice Wears, Oh, Everything.” Kroll and the wardrobe department go all-out on this outfit: a half-dozen necklaces, layers of see-through or metallic garments, headbands and goggles galore, all clashing in a riot of color and texture as improvisational and chaotic as Fabrice Fabrice’s last poem. And like that poem, it all comes together somehow. Kroll’s conclusion—“And that’s what Comedy Bang! Bang! is: a turkey sandwich right before bed”—underlines the episode’s tone of cheerful intimacy. Like a turkey sandwich before bed, like Scott’s assortment of sweaters, like three friends riffing one last time in the same old spot, this last episode is as cozy and familiar as the trusty pop-culture tropes that Comedy Bang! Bang! riffs on endlessly. As it turns out, Scott will never have to answer that question for himself, and he’ll never have to join the family business as a sicario for a Mexican cartel. Just as he’s saying goodbye, it dawns on him that long as TV and films keep being made, he and his companions can keep rippin’ ’em off. They’ll never run out of ideas, so they never have to stop this labor of love. Not even the unexpected arrival of Lou from Lou’s Camera Rental (a last appearance by Aukerman’s Mr. Show colleague and legendary comedy mentor Bob Odenkirk) to take back their cameras can daunt these stalwart performers. The absurdist sketches and spoofs of Comedy Bang! Bang! were never about raising the ratings or expanding the audience. Aukerman himself describes it as “a niche show,” developed as television programming shifted from tapping broad appeal to “finding the margins.” So what if no one will ever see the future episodes? “Exactly!” Scott exclaims. “Nothing has to change!” Comedy Bang! Bang! has always been die-hard comedy nerds performing for a small audience of die-hard comedy nerds, and that’s how it goes out. As the last camera pulls away, still rolling, Scott’s on-screen credit hovers in the air at an angle, suggesting those yellow letters aren’t a chyron added in post, but a tangible, naturally occurring element of this universe. The camera pans around the studio, showing us the crew working and looking on, and finally moving outside as it, and we, leave Studio 1 behind, with Scott and his guests diving into the first episode of the new, not-for-broadcast era. They don’t need cameras, and—as much as they value their audience—they don’t need us. Instead of going out with a bang, Scott Aukerman’s dream job is going on with a Bang! Bang! Just not for us. That’s as fitting and surreal an ending as I can imagine to this surrealist talk-show comedy. My hat is off to you, Comedy Bang! Bang! Comedy Bang! Bang! is no more. Long live Comedy Bang! Bang! Scott’s on-screen credit: Show’s Over, Man. Scott’s on-screen credit for the first not-for-broadcast episode: Ascot Cardigan. One last shoutout to the wardrobe department, who honored Comedy Bang! Bang!’s credit sequence by finding “Weird Al” Yankovic a chattering teeth shirt for this final appearance—unless that shirt comes from “Weird Al”’s personal collection. “Lord Andrew Lloyd Webber Wears A Purple Top Hat & Fabrice Fabrice Wears One Pink Fur Leg Warmer” may be the last broadcast episode of Comedy Bang! Bang! (or, as Aukerman says in his interview with Erik Adams, maybe not), but never forget the true series finale. It’s been a pleasure to review Comedy Bang! Bang! for The A.V. Club alongside LaToya Ferguson. Thank you for reading!